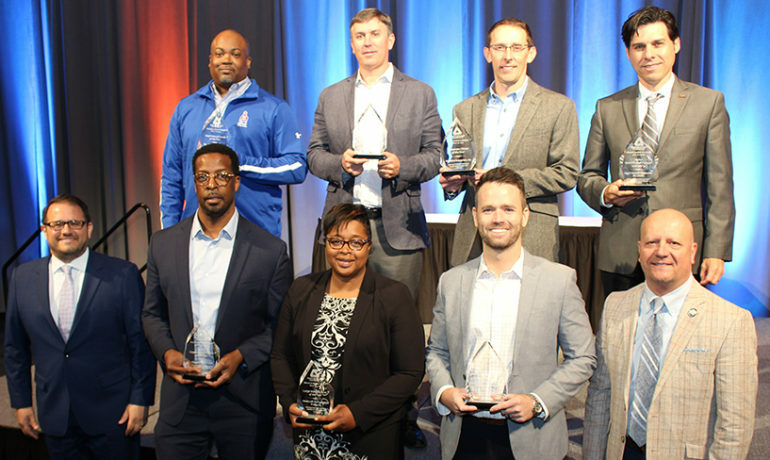 (GWINNETT-METRO ATLANTA) March 28, 2019 – Partnership Gwinnett, in collaboration with Gwinnett Technical College, announced the winners of the 8th Annual Movers & Makers Awards during today’s ceremony at the Infinite Energy Forum. Over 300 community leaders and industry experts attended the 2019 Movers & Makers Awards, presented by Jackson EMC. It is the largest event of its kind in Georgia and the County’s annual recognition of exceptional Gwinnett-based companies involved in manufacturing, processing, or distribution. The 2019 Corporate Citizen Award went to Valentine Enterprises. The award recognizes companies who go above and beyond to make their company and their community a great place to be. The Movers & Makers Awards also recognized Peachtree Packaging & Display as the community’s MVP, Most Valuable Provider, to the manufacturing and supply chain industries. Eligible companies were evaluated based upon local community impact, corporate social responsibility, and their workforce excellence programs.